For Olympic field hockey, see Field hockey at the Summer Olympics. Ice hockey tournaments have been staged at the Olympic Games since 1920. The men's tournament was introduced at the 1920 Summer Olympics and was transferred permanently to the Winter Olympic Games program in 1924, in France. The women's tournament was first held at the 1998 Winter Olympics. The Olympic Games were originally intended for amateur athletes. However, the advent of the state-sponsored "full-time amateur athlete" of the Eastern Bloc countries further eroded the ideology of the pure amateur, as it put the self-financed amateurs of the Western countries at a disadvantage. The Soviet Union entered teams of athletes who were all nominally students, soldiers, or working in a profession, but many of whom were in reality paid by the state to train on a full-time basis. In 1986, the International Olympic Committee (IOC) voted to allow professional athletes to compete in the Olympic Games starting in 1988. The National Hockey League (NHL) was initially reluctant to allow its players to compete because the Olympics are held in the middle of the NHL season, and the league would have to halt play if many of its players participated. Eventually, NHL players were admitted starting in 1998. However, the NHL again refused to release its players starting in 2018. From 1924 to 1988, the tournament started with a round-robin series of games and ended with the medal round. Medals were awarded based on points accumulated during that round. In 1992, the playoffs were introduced for the first time since 1920. In 1998, the format of the tournament was adjusted to accommodate the NHL schedule; a preliminary round was played without NHL players or the top six teams—Canada, the Czech Republic, Finland, Russia, Sweden and the United States—followed by a final round which included them. The tournament format was changed again in 2006; every team played five preliminary games with the full use of NHL players. The games of the tournament follow the rules of the International Ice Hockey Federation (IIHF), which differ slightly from the rules used in the NHL. The tournament follows the World Anti-Doping Agency's (WADA) rules on performance-enhancing drugs and the IIHF maintains a Registered Testing Pool (RTP), a list of top players who are subjected to random in-competition and out-of-competition drug tests. Several players have tested positive for banned substances since the 1972 Winter Olympics. In the men's tournament, Canada was the most successful team of the first three decades, winning six of seven gold medals. Czechoslovakia, Sweden and the United States were also competitive during this period and won multiple medals. Between 1920 and 1968, the Olympic hockey tournament was also counted as the Ice Hockey World Championship for that year. The Soviet Union first participated in 1956 and overtook Canada as the dominant international team, winning seven of the nine tournaments in which they participated. The United States won gold medals in 1960 and in 1980, which included their "Miracle on Ice" upset of the Soviet Union. Canada went 50 years without a gold medal, before winning one in 2002, and following it with back-to-back wins in 2010 and 2014. Other nations to win gold include Great Britain in 1936, the Unified Team in 1992, Sweden in 1994 and 2006 and the Czech Republic in 1998. Other medal-winning nations include Switzerland, Germany, Finland and Russia. In July 1992, the IOC voted to approve women's hockey as an Olympic event; it was first held at the 1998 Winter Olympics in Nagano. The Nagano Organizing Committee was hesitant to include the event because of the additional costs of staging the tournament, but an agreement was reached that limited the field to six teams, and ensured that no additional facilities would be built. The Canadian teams have dominated the event. The United States won the first tournament in 1998 and the most recent in 2018. Canada has won all of the other tournaments (2002–2014). 2.1.4 1980: The "Miracle on Ice"
The first Olympic ice hockey tournament took place at the 1920 Summer Olympics in Antwerp, Belgium. At the time, organized international ice hockey was still relatively new. The International Ice Hockey Federation (IIHF), the sport's governing body, was created on 15 May 1908, under the name Ligue Internationale de Hockey sur Glace. At the 1914 Olympic Congress in Paris, ice hockey was added to the list of optional sports that Olympics organizers could include. The decision to include ice hockey for the 1920 Summer Olympics was made in January, three months before the start of the Games. Several occurrences led to the sport's inclusion in the programme. Five European nations had committed to participating in the tournament and the managers of Antwerp's Palais de Glace stadium refused to allow the building to be used for figure skating unless ice hockey was included. The IIHF considers the 1920 tournament to be the first Ice Hockey World Championship. From then on, the two events occurred concurrently, and every Olympic tournament until 1968 is counted as the World Championship. The Olympic Games were originally intended for amateur athletes, so the players of the National Hockey League (NHL) and other professional leagues were not allowed to play. The first Winter Olympic Games were held in 1924 in Chamonix, France. Chapter 1, article 6, of the 2007 edition of the Olympic Charter defines winter sports as "sports which are practised on snow or ice". Ice hockey and figure skating were permanently integrated in the Winter Olympics programme. The IOC made the Winter Games a permanent fixture and they were held the same year as the Summer Games until 1992. Following that, further Winter Games have been held on the third year of each Olympiad. The men's tournament held at the 1920 Summer Olympics was organized by a committee that included future IIHF president Paul Loicq. The tournament used the Bergvall System, in which three rounds were played. The first round was an elimination tournament that determined the gold medal winner. The second round consisted of the teams that were defeated by the gold medal winner; the winner of that round was awarded the silver medal. The final round was played between teams that had lost to the gold or silver medal winners; the winner of that round received the bronze medal. The tournament was played from 23 to 29 April and seven teams participated: Canada, Czechoslovakia, the United States, Switzerland, Sweden, France and Belgium. Canada chose to send the Allan Cup-winning Winnipeg Falcons. The Swedish team consisted of mostly bandy players, many of whom had only started playing hockey in preparation for the tournament. Canada won all three of the team's games in the first round and won the gold medal, defeating Sweden in the final and outscoring opponents 27–1. In the two subsequent rounds, the United States and Czechoslovakia won the silver and bronze medals respectively. The Bergvall System was criticized, especially in Sweden, because the Swedish team had to play six games (winning three) while the bronze medal winning Czech team only had to play three (winning one). Erik Bergvall, the creator of the system, stated that it was used incorrectly and that a tournament of all of the losing teams from the first round should have been played for the silver medal. Because of these criticisms, the Bergvall System was not used again for ice hockey. In 1924, the tournament was played in a round-robin format, consisting of a preliminary round and a medal round. The medals were awarded based on win–loss records during the medal round. This format was used until 1988, although the number of teams and games played varied slightly. The Toronto Granites, representing Canada, became one of the dominant hockey teams in Olympic history, outscoring opponents 110–3, led by Harry Watson, who scored 36 goals. The United States won silver and Great Britain won bronze. Watson's 36 goals remains the tournament record for career goals. He also set the record for career points with 36 (assists were not counted at the time), which stood until 2010. Eleven teams participated in the 1928 Winter Olympics in St. Moritz, Switzerland. The Canadian team was given a bye to the medal round and won all of its games by a combined score of 38–0. The Swedish and Swiss teams won their first medals—silver and bronze respectively—and a German team participated for the first time, finishing ninth. At the 1932 Winter Olympics, Canada won gold in a tournament that consisted of four teams that played each other twice. Germany won bronze, the nation's first medal in the sport. Two days before the 1936 Winter Olympics in Garmisch-Partenkirchen, Germany, Canadian officials protested that two players on the British team—James Foster and Alex Archer—had played in Canada but transferred without permission to play for clubs in the English National League. The IIHF agreed with Canada, but Great Britain threatened to withdraw the team if the two were barred from competing. To avoid a conflict, Canada withdrew the protest shortly before the Games began. The tournament consisted of four groups and fifteen teams. Great Britain became the first non-Canadian team to win gold; Canada won silver and the United States bronze. World War II forced the cancellation of the 1940 and 1944 Winter Olympics. During the run-up to the 1948 Winter Olympics in St. Moritz, Switzerland, a conflict broke out between two American ice hockey bodies, the American Hockey Association (AHA) and the Amateur Athletic Union (AAU). The AAU, which had run amateur hockey in the United States since 1930, was expelled by the IIHF in 1947 when it refused to support a team composed of players from the AHA (because they believed that AHA players were "openly paid salaries" and at the time, the Olympics were strictly for amateur players). The Swiss Olympic Organizing Committee (SOOC) had accepted the AHA's application, but Avery Brundage of the International Olympic Committee (IOC) threatened to ban the entire American team if the AHA participated in the Olympics. The IIHF countered by threatening to withdraw hockey from the Games if the AHA were banned. The IOC suggested that both American teams be banned but the SOOC rejected this proposal. The IOC decided to switch hockey to an unofficial event but relented when a compromise was reached. The AHA team was allowed to compete but would not be considered an official participant or allowed to win a medal. The AHA team finished fourth in the standings. Both Czechoslovakia and Canada won seven games and tied when they played each other. The gold medal winner was determined by goal difference: Canada won the gold because it had an average of 13.8 goals per game compared to Czechoslovakia's average of 4.3. Czechoslovakia's team was quickly improving; it won the 1947 and 1949 World Championships. At the 1952 Winter Olympics in Oslo, Norway, the gold medal was won by Canada's team for the second consecutive Games. It would be the last time that a Canadian team would win a gold medal in hockey for 50 years. The United States won silver and Sweden won bronze. A team from Finland competed for the first time. Vladislav Tretiak is the only male athlete to have won three gold medals and one silver in ice hockey. The Soviet Union competed in its first World Championship in 1954, defeating Canada and winning the gold medal. At the 1956 Winter Olympics in Cortina d'Ampezzo, Italy, the Soviet team went undefeated and won its first gold medal. Canada's team lost to the Soviets and the United States in the medal round, winning the bronze. The 1960 Winter Olympics, in Squaw Valley, United States, saw the first, and to date only, team from Australia compete in the tournament. Canada, the Soviet Union, Czechoslovakia and Sweden were the top four teams heading into the Games, but were all defeated by the American team, which won all seven games en route to its first Olympic gold medal. Canada won the silver medal and the Soviet Union won the bronze. At the 1964 Winter Olympics in Innsbruck, Austria, the Soviet team won all seven of its games, earning the gold medal. Canada finished the tournament with five wins and two losses, putting the team in a three-way tie for second place with Sweden and Czechoslovakia. Before 1964, the tie-breaking procedure was based on goal difference in games against teams in the medal round; under that system, Canada would have placed third ahead of the Czechoslovakian team. During the tournament the procedure was changed to take all games into consideration, which meant that the Canadians finished fourth. At the time, the Olympics counted as the World Championships; under their (unchanged) rules, Canada should have received bronze for the World Championships. The Soviet Union won its third gold medal with a 7–1 record in the 1968 Grenoble Olympics. Czechoslovakia and Canada won the silver and bronze medals. It was the last time that the Olympics were counted as the World Championships. In 1970, Canada withdrew from international ice hockey competition protesting the use of full-time "amateurs" by the Soviet Union and Czechoslovakia, and the team did not participate in the 1972 and 1976 Winter Olympics. Led by goaltender Vladislav Tretiak and forwards Valeri Kharlamov, Alexander Yakushev, Vladimir Petrov and Boris Mikhailov, the Soviet team won gold at both the 1972 Games in Sapporo, Japan and 1976 Winter Olympics in Innsbruck, Austria. In 1971, the United States finished last at the World Championships and was relegated to Pool B. The team qualified for the 1972 Olympics and won silver, making it the first Pool B team to win an Olympic medal. Czechoslovakia won the bronze medal in 1972. In 1976, Czechoslovakia won the silver and West Germany won bronze. Along with Canada, the Swedish team did not participate in the 1976 tournament joining the boycott. 1980: The "Miracle on Ice"
The 1980 gold medal-winning American team had the honour of lighting the Olympic cauldron at the 2002 Winter Olympics. The Winter Olympics returned to Lake Placid, New York in 1980. Twelve teams participated in the tournament, including Canada for the first time since 1968. The Soviet Union entered the tournament as favourites and were considered natural rivals with the American team due to the Cold War. The Americans, coached by Herb Brooks and consisting mainly of college students, tied Sweden and scored an upset win over Czechoslovakia in the preliminary round. They advanced to the medal round along with Sweden, Finland and the Soviet Union. The 22 February medal-round game between the Soviet Union and the United States became famously known as the "Miracle on Ice." The Soviets took a 2–1 lead, but the Americans tied the game with one second left in the first period. In the second period, Soviet goaltender Vladislav Tretiak was replaced by Vladimir Myshkin. The Soviets regained the lead early in the second period. However, the Americans kept the game close due to the goaltending of Jim Craig. In the third period, the Americans scored two goals, including the game winner by captain Mike Eruzione with exactly 10 minutes left to give the Americans a 4–3 lead. Craig withstood another series of Soviet shots to preserve the win. In the final seconds of the game, American Broadcasting Company sportscaster Al Michaels delivered his famous line: "Do you believe in miracles? Yes!" The final rankings were based on points accumulated in matches against the other teams in the medal round. Despite the common misconception that the Americans won gold the night they beat the Soviets, this did not occur until 24 February when they defeated Finland 4–2 and finished the tournament undefeated. The Soviets finished with silver; Sweden won the bronze. In 2008, the IIHF picked the Miracle on Ice as the top international hockey story of the past 100 years. At the 1984 Winter Olympics in Sarajevo, Yugoslavia, the Soviet Union won its sixth gold medal. Czechoslovakia and Sweden won the silver and bronze medals. The 1988 Winter Olympics were held in Calgary, Alberta, Canada, where the Soviet team captured its seventh and final gold medal. The Soviets' last Olympic game was a loss to Finland. The Finnish team was not considered a serious medal contender—it had competed in the World Championships since 1939 and had not won a single medal. However, Finland upset the Soviets 2–1 and won silver. The IIHF decided to change the tournament format because in several cases, the gold medal winner had been decided before the final day of play. During a congress in 1990, the IIHF introduced a playoff system. The new system was used at the 1992 Winter Olympics in Albertville, France. Preliminary round-robin games were held and followed by an eight-team cup-system style medal round that culminated in a gold medal game. Finnish centre Raimo Helminen, a six-time Olympian, won a silver in 1988 and bronze medals in 1994 and 1998. Before 1989, players who lived in the Soviet Union, Czechoslovakia, and other nations behind the Iron Curtain were not allowed to leave and play in the NHL. Soviet officials agreed to allow players to leave following the 1989 World Championships. The Soviet Union dissolved in December 1991. Nine former Soviet states became part of the IIHF and started competing internationally, including Belarus, Kazakhstan, Latvia and Ukraine. At the 1992 Olympics, Armenia, Belarus, Kazakhstan, Russia, Ukraine and Uzbekistan competed as one entity, known as the Unified Team. In the final, the Unified Team defeated Canada to win gold while Czechoslovakia won the bronze. Czechoslovakia split into the Czech Republic and Slovakia in January 1993. The IIHF recognized the Czech Republic as the successor to Czechoslovakia, allowing the team to retain its position in the top World Championship division, while Slovakia started in the lowest division (Pool C) in 1994 and was forced to work its way up. Both nations competed in the tournament at the 1994 Winter Olympics, as did Russia. Slovakia and Finland both finished the preliminary round undefeated. Slovakia lost their medal round quarter-final game to Russia 2–3 OT, who later lost to Sweden 3–4 in the semi-final and Finland (who was defeated by Canada in the another semi-final) 0–4 in the bronze medal game. In the gold medal game between Sweden and Canada, both teams finished regulation and overtime play with a 2–2 tie. In the resulting shootout, the first in Olympic competition, both nations scored two goals, which resulted in a sudden death shootout. Peter Forsberg of Sweden scored one of the most famous goals in Olympic history by faking a forehand shot, then sliding a one-handed backhand shot past goaltender Corey Hirsch. Canada's final shooter Paul Kariya's shot was saved by Tommy Salo and Sweden won the game and its first gold medal. The 1998 gold medal game between Russia and the Czech Republic was the first played between teams consisting mainly of NHL players. In 1995, an agreement to allow NHL players to participate in Olympics was reached between the IOC, IIHF, NHL, and National Hockey League Players' Association (NHLPA). The format of the 1998 tournament was adjusted to accommodate the NHL's schedule. Canada, considered a pre-tournament favourite, was upset in the semi-final round by the Czech Republic and then lost the bronze medal game to Finland. Led by goaltender Dominik Hašek, the Czech team defeated Russia, winning its first gold medal in the sport. Following the tournament, NHL commissioner Gary Bettman commented that it "was what we had predicted and hoped for from a pure hockey perspective, [it was] a wonderful tournament". 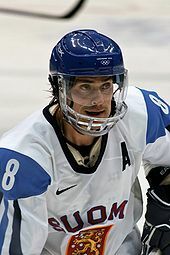 With 43 points, Teemu Selänne of Finland is the all-time leading scorer in the men's tournament. The next tournament format was hosted at in Salt Lake City, United States. Finnish centre Raimo Helminen became the first ice hockey player to compete in six tournaments. In the quarter-finals, Belarus defeated Sweden in one of the biggest upsets since the Miracle on Ice. The team lost to Canada 7–1 in the semi-final and Russia 7–2 in the bronze medal game, respectively. The Canadian team rebounded from a disappointing first round and defeated the American team (who eliminated Russia 3–2 in the semi-final) in the gold medal game, winning their first gold medal in 50 years and seventh in men's hockey overall. The tournament format was adjusted for 2006. In the semi-finals, Sweden defeated the Czech Republic 7–3, and Finland ousted Russia 4–0. Sweden won the gold medal over Finland 3–2 and the Czech Republic won the bronze medal over Russia 3–0. Three months later, Sweden won the 2006 World Championships and became the first team to win the Olympic and World Championship gold in the same year. Members of the Canadian team celebrate moments after Sidney Crosby's gold medal winning overtime goal at the 2010 Winter Olympics. The 2010 Winter Olympics were held in Vancouver, British Columbia, Canada, the first time since NHL players started competing that the Olympics were held in a city with an NHL team. Teemu Selänne of Finland scored his 37th point, breaking the record of 36 first set by Canadian Harry Watson in 1924 and later tied by Vlastimil Bubník of Czechoslovakia, and Valeri Kharlamov of the Soviet Union. Slovakia made the final four for the first time, but lost the bronze medal game to Finland 3–5. In the gold medal game, Canada and the United States ended regulation play with a 2–2 tie, making it only the second Olympic gold medal match to go into overtime. Canadian player Sidney Crosby scored the winning goal 7:40 into overtime play to give Canada its eighth gold medal in men's hockey. The 2014 Winter Olympics were held in Sochi, Russia, and retained the same game format used in Vancouver 2010, while returning to the larger international-sized ice rinks. Slovenia participated for the first time, upsetting Slovakia in the round-robin before losing to Sweden in the quarterfinals 0–5, for its best finish in any international tournament. Latvia upset Switzerland 3–1 in the qualification playoffs, also making it to the Olympic quarterfinals for the first time, where they were narrowly defeated by Canada 2–1. Host nation Russia, considered a pre-tournament favourite, lost 3–1 in the quarterfinals to Finland and finished 5th. Entering the semi-finals undefeated after outscoring opponents 20–6, the United States lost to Canada 0–1, then lost the bronze medal game against Finland 0–5. Teemu Selänne scored six more points in the tournament, was named tournament MVP and boosted his modern-era Olympic career record for points to 43 (24 goals, 19 assists). At the age of 43, he also set records as both the oldest Olympic goal-scorer and oldest Olympic ice hockey medal winner. Canada defeated Sweden 3–0 to win its ninth Olympic gold medal. The team did not trail at any point over the course of the tournament, and became the first back-to-back gold medal winner since the start of NHL participation in 1998, as well as the first team to go undefeated since 1984. The Olympic ice hockey tournament in PyeongChang in 2018 was held without participation of NHL players, for the first time since the 1994 Winter Olympics in Lillehammer. The favorites to win the gold medal were the Russians due to their domestic league, the KHL, taking an Olympic break and allowing such stars as Pavel Datsyuk and Ilya Kovalchuk to play on the team. By the decision of the IOC, they were allowed to compete under the Olympic flag and after passing the anti-doping tests, which was the result of a doping scandal in Russia. The final was played between the Germans, who unexpectedly eliminated the Canadians in the semifinal, and the Olympic Athletes from Russia. In the final, the Russians prevailed, defeating Germany 4–3, and won the gold medal after Kirill Kaprizov scored the winning goal into the overtime play. The Russian team sang the banned anthem during the medal ceremony, but the IOC decided not to pursue any action. Canada won the bronze medal over the Czech Republic 6–4. Canadian Hayley Wickenheiser is the all-time leading scorer in the women's tournament and was named tournament MVP twice. At the 99th IOC Session in July 1992, the IOC voted to approve women's hockey as an Olympic event beginning with the 1998 Winter Olympics as part of their effort to increase the number of female athletes at the Olympics. Women's ice hockey had not been in the programme when Nagano, Japan had won the right to host the Olympics in June 1991, and the decision required approval by the Nagano Winter Olympic Organizing Committee (NAOOC). The NAOOC was initially hesitant to include the event because of the additional costs of staging the tournament and because they felt their team, which had failed to qualify for that year's World Championships, could not be competitive. According to Glynis Peters, the Canadian Amateur Hockey Association's (CAHA) head of female hockey, "the Japanese would have to finance an entirely new sports operation to bring their team up to Olympic standards in six years, which they were also really reluctant to do." In November 1992, the NWOOC and IOC Coordination Committee reached an agreement to include a women's ice hockey tournament in the programme. Part of the agreement was that the tournament would be limited to six teams, and no additional facilities would be built. The CAHA also agreed to help build and train the Japanese team so that it could be more competitive. The IOC had agreed that if the NAOOC had not approved the event, it would be held at the 2002 Winter Olympics. The format of the first tournament was similar to the men's: preliminary round-robin games followed by a medal round playoff. Before 1998, women's hockey had been dominated by Canada. Canadian teams had won every World Championship up to that point; however, by 1997, the American team had improved and was evenly matched with Canada. In thirteen games played between the two teams in 1997, Canada won seven and the United States won six. The 1998 Olympic tournament also included teams from Finland, Sweden, China and host Japan. Canada and the United States dominated the round-robin portion. In their head-to-head match, the United States overcame a 4–1 deficit to win 7–4. The two teams met in the final, which the United States won 3–1 to become the third American ice hockey team to win Olympic gold. Finland defeated China 4–1 to win the bronze medal. For the 2002 Winter Olympics, the number of teams was increased to eight with Russia, Germany and Kazakhstan qualifying for the first time. The Canadian and American teams went undefeated in the first round and semi-finals, setting up a gold medal rematch that the Canadian team won 3–2. Following the game, members of the Canadian team accused the Americans of stomping on a Canadian flag in their dressing room, although an investigation later proved the rumour false. The Swedish team won the bronze medal over Finland 2–1, the nation's first in women's ice hockey. In 2006, the American team was upset in the semi-final game, by Sweden 2–3 SO, marking the first time that it had lost to an opponent other than Canada. The upset drew comparisons to the Miracle on Ice from 1980. In the medal games, Canada defeated Sweden 4–1 to claim its second consecutive gold medal, while the Americans beat Finland 4–0 to win the bronze. In 2010, eight teams participated, including Slovakia for the first time. In the gold medal game, Canada defeated the United States 2–0 to win their third consecutive gold. The Finnish team won the bronze medal over Sweden 3–2 OT, their first since 1998. The Swiss team celebrates shortly after winning the bronze medal at the 2014 Winter Olympics. It was the first medal for the country in women's hockey. At the 2014 Winter Olympics, Canada defeated the United States 3–2, as Marie-Philip Poulin scored at 8:10 of overtime to win their fourth consecutive gold, rebounding from a two-nothing deficit late in the game. With the win, Canadians Hayley Wickenheiser, Jayna Hefford and Caroline Ouellette became the first athletes to win four ice hockey gold medals. They also joined Soviet biathlete Alexander Tikhonov and German speedskater Claudia Pechstein as the only athletes to win gold medals in four straight Winter Olympics. In the bronze medal game Switzerland beat Sweden 4–3 to win their first women's medal. In 2018, the United States defeated Canada for the gold medal in a shootout, winning 3–2. The Americans' winning the gold medal game marks the first time in 20 years that the United States took home a gold medal in women's hockey. They previously won in 1998 in Nagano, Japan, which was also against Canada. Canada's loss effectively ended their winning streak of four consecutive winter games, having won since 2002. The 2022 edition will be played with ten teams. Since 1976, 12 teams have participated in the men's tournament, except in 1998 and 2002, when the number was raised to 14. The number of teams has ranged from 4 (in 1932) to 16 (in 1964). 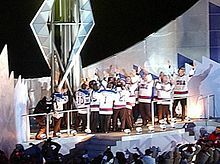 After the NHL allowed its players to compete at the 1998 Winter Olympics, the "Big Six" teams (Canada, the Czech Republic, Finland, Russia, Sweden and the United States) were given automatic qualification and byes to the final round. The number of teams was increased to 14 so that a preliminary round-robin tournament consisting of eight teams could be held. The top two teams from the preliminary round (Belarus and Kazakhstan) joined the "Big Six" in the finals. A similar system was used in 2002. For the following tournament, the number of teams was lowered to 12 so that all teams played fewer games. Qualification for the men's tournament at the 2010 Winter Olympics was structured around the 2008 IIHF World Ranking. Twelve spots were made available for teams. The top nine teams in the World Ranking after the 2008 Men's World Ice Hockey Championships received automatic berths. Teams ranked 19th through 30th played in a first qualification round in November 2008. The top three teams from the round advanced to the second qualification round, joined by teams ranked 10th through 18th. The top three teams from this round advanced to the Olympic tournament. The women's tournament uses a similar qualification format. The top six teams in the IIHF Women's World Ranking after the 2008 Women's World Ice Hockey Championships received automatic berths. Teams ranked 13th and below were divided into two groups for a first qualification round in September 2008. The two group winners advanced to the second qualification round, where the teams ranked seventh through twelfth joined them. "Each player must be under the jurisdiction of an IIHF member national association." "Each player must be a citizen of the country he/she represents." If a player who has never played in an IIHF competition changes their citizenship, they must participate in national competitions in their new country for at least two consecutive years and have an international transfer card (ITC). If a player who has previously played in an IIHF tournament wishes to change their national team, they must have played in their new country for four years. A player can only do this once. The original IOC rules stated that an athlete that had already played for one nation could not later change nations under any circumstances. 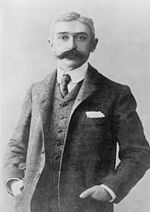 Pierre de Coubertin, founder of the IOC, was influenced by the ethos of the aristocracy as exemplified in the English public schools. The public schools subscribed to the belief that sport formed an important part of education and there was a prevailing concept of fairness in which practicing or training was considered cheating. As class structure evolved through the 20th century, the definition of the amateur athlete as an aristocratic gentleman became outdated. The advent of the state-sponsored "full-time amateur athlete" of the Eastern Bloc countries further eroded the ideology of the pure amateur, as it put the self-financed amateurs of the Western countries at a disadvantage. The Soviet Union entered teams of athletes who were all nominally students, soldiers, or working in a profession, but many of whom were in reality paid by the state to train on a full-time basis. Nevertheless, the IOC held to the traditional rules regarding amateurism until 1988. Near the end of the 1960s, the Canadian Amateur Hockey Association (CAHA) felt their amateur players could no longer be competitive against the Soviet team's full-time athletes and the other constantly improving European teams. They pushed for the ability to use players from professional leagues but met opposition from the IIHF and IOC. At the IIHF Congress in 1969, the IIHF decided to allow Canada to use nine non-NHL professional hockey players at the 1970 World Championships in Montreal and Winnipeg, Manitoba, Canada. The decision was reversed in January 1970 after IOC President Brundage said that ice hockey's status as an Olympic sport would be in jeopardy if the change was made. In response, Canada withdrew from international ice hockey competition and officials stated that they would not return until "open competition" was instituted. Günther Sabetzki became president of the IIHF in 1975 and helped to resolve the dispute with the CAHA. In 1976, the IIHF agreed to allow "open competition" between all players in the World Championships. However, NHL players were still not allowed to play in the Olympics, because of the unwillingness of the NHL to take a break mid-season and the IOC's amateur-only policy. Before the 1984 Winter Olympics, a dispute formed over what made a player a professional. The IOC had adopted a rule that made any player who had signed an NHL contract but played less than ten games in the league eligible. However, the United States Olympic Committee maintained that any player contracted with an NHL team was a professional and therefore not eligible to play. The IOC held an emergency meeting that ruled NHL-contracted players were eligible, as long as they had not played in any NHL games. This made five players on Olympic rosters—one Austrian, two Italians and two Canadians—ineligible. Players who had played in other professional leagues—such as the World Hockey Association—were allowed to play. Canadian hockey official Alan Eagleson stated that the rule was only applied to the NHL and that professionally contracted players in European leagues were still considered amateurs. Murray Costello of the CAHA suggested that a Canadian withdrawal was possible. In 1986, the IOC voted to allow all athletes to compete in the Olympic Games starting in 1988. NHL players Saku Koivu of Finland and Pavel Datsyuk of Russia face off in a semi-final game at the 2006 Winter Olympics. The NHL decided not to allow all players to participate in 1988, 1992, 1994 and 2018 because the Winter Olympics typically occur in February, during the league's regular season. To allow participation, the NHL would have been forced to take a break in its schedule. In 1992, National Basketball Association (NBA) players participated in the 1992 Summer Olympics. The American "Dream Team" dominated the tournament, and NHL commissioner Gary Bettman (an NBA executive in 1992) commented that the "[NBA]'s worldwide awareness grew dramatically". He hoped that NHL participation would "get exposure like the world has never seen for hockey". The typical NBA season is held in the winter and spring, so the Summer Olympics do not conflict with the regular season schedule. Bettman "floated a concept of moving hockey to the Summer Games", but this was rejected because of the Olympic Charter. In March 1995, Bettman, René Fasel, IOC president Juan Antonio Samaranch and NHLPA executive director Bob Goodenow met in Geneva, Switzerland. They reached an agreement that allowed NHL players to participate in the Olympics, starting with the 1998 Games in Nagano, Japan. The deal was officially announced by the NHL on 2 October 1995. Bettman said: "We're doing this to build the game of hockey, pure and simple, we think whatever benefits are recouped, it will end up making this game bigger, stronger and healthier." In 2002, Slovakia's team (pictured) was affected by NHL's late-season break as they were denied the full use of their top players in the preliminary round. The 2004–05 NHL season was locked out and eventually cancelled because of a labour dispute between the league and its players. In January 2005, Bettman commented that he was hesitant to allow league participation in the Olympics because he did not like the idea of stopping play mid-season after the cancellation of the previous season. The lockout was resolved in July 2005 and the newly negotiated NHL Collective Bargaining Agreement allowed league participation in the 2006 and 2010 Winter Olympics. Some NHL team owners were against their players participating in the tournament because of concerns about injury or exhaustion. Philadelphia Flyers owner Ed Snider commented that "I'm a believer in the Olympics and I think it's good for the NHL to participate, having said that, the people who participate should be the ones who are absolutely healthy." Some NHL players used the break as an opportunity to rest and did not participate in the tournament, and several players were injured during the Olympics and were forced to miss NHL games. Bettman said that several format changes were being discussed so that the tournament would be "a little easier for everybody". Prior to the 2014 Winter Olympics in Russia, a number of Russian NHL players, including Alexander Ovechkin, stated that they would play in the tournament with or without the NHL's approval. It was originally thought that for NHL participating in the 2014 Winter Olympics a deal would have to be negotiated between the NHL and NHLPA in the Collective Bargaining Agreement. In January 2013, the NHL and NHLPA agreed on a new Collective Bargaining Agreement. However, the decision on NHL participation at the Olympics was later announced on 19 July 2013. As part of the deal, the NHL will go on break for 17 days during the Olympics and will send 13 on-ice officials to help with the Games. NHL management was hesitant to commit to the tournament; Bettman argued the Olympic break is a "strain on the players, on the schedule and on fans", adding that "the benefits we get tend to be greater when the Olympics are in North America than when they're in distant time zones." According to Bettman, most of the NHL team owners agree with his position, and feel that the league does not receive enough benefits to justify the schedule break and risk of player injuries. René Fasel wants NHL participation and vowed that he would "work day and night to have NHL players in Sochi". At an October 2008 press conference, then-NHLPA executive director Paul Kelly stated that the players want to return to the Olympics and would try to include the ability in the next agreement. Russian NHL players Alexander Ovechkin and Evgeni Malkin stated that they want to participate in the tournament and would do so without the permission of the NHL, if necessary. Paul Kelly also believed that the NHL's strained relationship with the Ice Hockey Federation of Russia and the Kontinental Hockey League (KHL) could affect participation. In a 2009 interview, KHL president Alexander Medvedev claimed that the unwillingness of NHL officials to immediately commit to the Sochi Games was "an instrument of pressure" to force a transfer agreement between the two leagues. A major sticking point over NHL participation has been the insurance of players; for the 2014 Winter Olympics, the IOC paid around US$7 million to insure NHL players participating in the Games. In April 2016, the IOC announced that beginning in 2018, it would no longer cover accommodations, insurance, or travel for NHL players in the Olympics, prompting the IIHF to ask for support from national ice hockey associations and National Olympic Committees to help cover costs; Matti Nurminen of the Finnish Ice Hockey Association argued that it was the responsibility of the event's organizer to cover costs, and that "In our opinion, the same party should pay the bills, and that’s not us. All the countries replied to the IIHF that they are not willing to pay for the insurance or the travel or any of the other expenses that are related to having the NHL players participate in Pyeongchang." The New York Times felt that the removal of this financial support would put NHL participation at Pyeongchang in jeopardy, noting the already-strenuous relationship between the NHL and the IOC; Gary Bettman noted that the NHL does not profit from their presence, adding that "in fact, we kind of disappear for two weeks because historically the IOC hasn't even let us join in promoting our participation in the Olympics." On 3 April 2017, the NHL announced that it would not participate in the 2018 Winter Olympics. In that statement, the NHL said that it had been open to hearing from the IOC, the IIHF, and the players' association on ways to make Olympic participation more attractive to team owners, but no meaningful dialogue on that matter had materialized. As to reasons the Board of Governors might be interested in re-evaluating their strongly held views on the subject, the NHLPA "confirmed that it has no interest or intention of engaging in any discussion that might make Olympic participation more attractive to the Clubs", and that it would not schedule a break for the Olympics in the 2017–18 season. At the first tournament in 1920, there were many differences from the modern game: games were played outdoors on natural ice, forward passes were not allowed, the rink (which had been intended to be used only for figure skating) was 56 m × 18 m (165 ft × 58.5 ft) and two 20-minute periods were played. Each team had seven players on the ice, the extra position being the rover. Following the tournament, the IIHF held a congress and decided to adopt the Canadian rules—six men per side and three periods of play. In 2010, games were played on an NHL-sized rink surface for the first time (size comparison pictured). The tournaments follow the rules used by the IIHF. At the 1969 IIHF Congress, officials voted to allow body-checking in all three zones in a rink similar to the NHL. Before that, body-checking was only allowed in the defending zone in international hockey. Several other rule changes were implemented in the early 1970s: players were required to wear helmets starting in 1970, and goaltender masks became mandatory in 1972. In 1992, the IIHF switched to using a playoff system to determine medalists and decided that tie games in the medal round would be decided in a shootout. In 1998, the IIHF passed a rule that allowed two-line passes. Before then, the neutral zone trap had slowed the game down and reduced scoring. The current IIHF rules differ slightly from the rules used in the NHL. 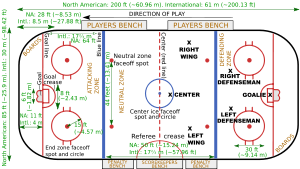 One difference between NHL and IIHF rules is standard rink dimensions: the NHL rink is narrower, measuring 61 m × 26 m (200 ft × 85 ft), instead of the international size of 61 m × 30.5 m (200 ft × 100 ft) The larger international size allows for a faster and less physical style of play. Another rule difference between the NHL and the IIHF rules concerns how icing is called. In the NHL, a linesman stops play due to icing if a defending player (other than the goaltender) is not behind an attacking player in the race to the end-zone faceoff dots in his defensive zone, in contrast to the IIHF rules in which play is stopped the moment the puck crosses the goal line. The NHL and IIHF also differ in penalty rules. The NHL calls five-minute major penalties for more dangerous infractions of the rules, such as fighting, in addition to the minor and double minor penalties called in IIHF games. This is in contrast to the IIHF rule, by which players who fight are ejected from the game. Beginning with the 2005–06 season, the NHL instituted several new rules. Some were already used by the IIHF, such as the shootout and the two-line pass. Others were not picked up by the IIHF, such as those requiring smaller goaltender equipment and the addition of the goaltender trapezoid to the rink. However, the IIHF did agree to follow the NHL's zero-tolerance policy on obstruction and required referees to call more hooking, holding, and interference penalties. Each team is allowed to have between 15 and 20 skaters (forwards and defencemen) and two or three goaltenders, all of whom must be citizens of the nation they play for. One of the conditions of the NHL's participation in the Olympics is to include regular NHL referees and linesmen in the tournament, despite the fact that they are American or Canadian, and thus gives the perception of American or Canadian bias in the officiating. The IIHF follows the World Anti-Doping Agency's (WADA) regulations on performance-enhancing drugs. The IIHF maintains a Registered Testing Pool, a list of top players who are subjected to random in-competition and out-of-competition drug tests. According to the WADA, a positive in-competition test results in disqualification of the player and a suspension that varies based on the number of offences. When a player tests positive, the rest of their team is subjected to testing; another positive test can result in a disqualification of the entire team. In 2001, the United States Olympic Committee (USOC) pushed for American NHL players who were potential Olympians to be subject to random drug tests. The USOC requires all Olympic-bound athletes to be randomly tested by the United States Anti-Doping Agency, but had exempted NHL players in 1998. The NHL preferred a more uniform method, in which all players would undergo the same number of tests from the WADA. An agreement was reached that the WADA would start testing players after the NHL playoffs were finished. Alois Schloder West Germany 1972 Ephedrine Six month suspension from IIHF The first Winter Olympics athlete to test positive for a banned substance, Schloder was banned from the rest of the Games but his team was allowed to continue playing. František Pospíšil Czechoslovakia 1976 Codeine None Team doctor Otto Trefny, who prescribed Pospíšil the drug as treatment for the flu, received a lifetime ban. The team was forced to forfeit a game against Poland but went on to win the silver medal, which Pospíšil also received. Jarosław Morawiecki Poland 1988 Testosterone 18-month suspension from IIHF The Polish team was allowed to continue playing without Morawiecki, but were stripped of two points they earned in a victory over France. Mattias Öhlund Sweden 2002 Acetazolamide None Öhlund had inadvertently ingested the substance in medication he was taking after undergoing eye surgery and was not suspended. Vasily Pankov Belarus 2002 19-Norandrosterone Retroactively disqualified Pankov was also forced to return his Olympic diploma. Evgeni Lositski, the team doctor, was banned from the following two Olympics. Ľubomír Višňovský Slovakia 2010 Pseudoephedrine Issued a reprimand Višňovský took Advil Cold & Sinus to combat a cold, unaware that it contained a WADA prohibited substance. He had consulted with the Slovak national team doctor and declared that he was taking the medication. Levels on samples two and three were well below WADA limits. Vitalijs Pavlovs Latvia 2014 Methylhexaneamine (dimethylpentylamine) Disqualified from quarter-final game Pavlovs was disqualified from the Canada-Latvia quarter-final game and was forced to return his Olympic diploma. According to Pavlovs, he had "been taking food supplements upon the recommendation of the doctor of his club team and that he did not understand how this substance entered his body." Nicklas Bäckström Sweden 2014 Pseudoephedrine Pulled from gold medal game Bäckström was taking an over-the-counter medication to treat a sinus condition. He consulted with the team doctor and was informed that there would not be a problem. Bäckström's medal was initially withheld but was returned the following month. The IOC determined that "there was no indication of any intent of the athlete to improve his performance by taking a prohibited substance." Ralfs Freibergs Latvia 2014 Anabolic androgenic steroid Disqualified from quarter-final game Freibergs was disqualified from the Canada-Latvia quarter-final game and was forced to return his Olympic diploma. In late 2005, two NHL players who had been listed as potential Olympians failed drug tests administered by the WADA. American Bryan Berard, who had competed in the 1998 Winter Olympics, tested positive for 19-Norandrosterone. Canadian José Théodore failed a drug test because he was taking Propecia, a hair loss medication that contains the non-performance-enhancing drug Finasteride. Both players received two-year bans from international competition, although neither had made their team's final roster. On 6 December 2017 six Russian ice hockey players were disqualified for doping violations. Results of the Russian women's team at the 2014 Winter Olympics were made void. Two other Russian players, Tatiana Burina and Anna Shukina, were also disqualified ten days later. # The final rank of the team. =# Indicates that two or more teams shared the same final rank. – The team did not participate that year. Q The team has qualified for the tournament. DSQ The team was disqualified during the tournament. The nation did not exist with that designation at that time. In 1920, medals were decided by the Bergvall system, games between the medal winning nations are shown. 1924 through 1988, medals were decided in the round-robin, games between the medal winning nations are shown. The medal ceremony for the women's tournament at the 2010 Winter Olympics, left to right: the United States (silver), Canada (gold) and Finland (bronze). The following is a list of the on-ice officials for the men's gold medal game beginning in 1920 and again from 1992 when such game was reintroduced. The editions in which National Hockey League players participated – from 1998 to 2014 – were primarily officiated by NHL officials. ^ a b Benjamin, Daniel (27 July 1992). "Traditions Pro Vs. Amateur". Time. Retrieved 18 March 2009. ^ "Ice hockey". International Olympic Committee. Archived from the original on 23 March 2009. Retrieved 1 March 2009. ^ Farrell, Arthur (1899). Hockey: Canada's Royal Winter Game. C.R. Corneil. p. 27. ^ a b c d "International hockey timeline". International Ice Hockey Federation. Retrieved 1 March 2009. ^ a b Podnieks & Szemberg 2008, Story #10–Czech Republic wins first "open" Olympics. ^ "Chamonix 1924". International Olympic Committee. Retrieved 31 January 2009. ^ "Olympic Charter" (PDF) (Press release). International Olympic Committee. 7 July 2007. Archived from the original (PDF) on 27 July 2011. Retrieved 4 March 2009. ^ "This Day in History 1924: First Winter Olympics". This day in History. A&E Television Networks. Archived from the original on 5 March 2009. Retrieved 1 August 2008. ^ "Sport: Winter Olympics 98–History of the winter Olympics". BBC News. 5 February 1998. Retrieved 6 April 2009. ^ a b Podnieks & Szemberg 2008, Story #21–Ice Hockey debuts at the Olympics. ^ a b c d e f Hansen, Kenth (May 1996). "The Birth of Swedish Ice Hockey – Antwerp 1920" (PDF). Citius, Altius, Fortius. International Society of Olympic Historians. 4 (2): 5–27. Retrieved 29 May 2009. 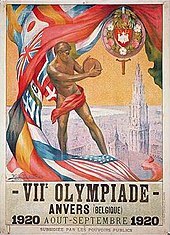 ^ "1920 – Summer Olympics VII (Antwerp, Belgium)". The Sports Network. Archived from the original on 2008-08-27. Retrieved 1 March 2009. ^ "United States is second at hockey; Victory Over Czechoslovak Team by 16 to 0 Gives Americans 3 Points in Olympics". The New York Times. 29 April 1920. Retrieved 1 March 2009. ^ "1924 – Winter Olympics I (Chamonix, France)". The Sports Network. Archived from the original on 2009-09-03. Retrieved 1 March 2009. ^ Podnieks & Szemberg 2008, Story #53–Harry Watson scores at will in Olympics. ^ "Ice Hockey at the 1924 Chamonix Winter Games: Men's Ice Hockey". sports-reference.com. Archived from the original on 7 June 2009. Retrieved 1 March 2009. ^ a b c "Selanne's 37th point tops Games mark". ESPN. 20 February 2010. Retrieved 24 September 2010. ^ "1928 – Winter Olympics II (St. Moritz, Switzerland)". The Sports Network. Archived from the original on 2009-09-03. Retrieved 1 March 2009. ^ Comité Olympique Suisse (1928). Rapport Général du Comité Exécutif des IImes Jeux Olympiques d'hiver (PDF) (in French). Lausanne: Imprimerie du Léman. Retrieved 31 January 2008. ^ "1932 – Winter Olympics III (Lake Placid, United States)". The Sports Network. Archived from the original on 2009-09-03. Retrieved 1 March 2009. ^ Lattimer, George, ed. (1932). Official Report III Olympic Winter Games Lake Placid 1932 (PDF). Lake Placid, New York: Olympic Winter Games Committee. pp. 70–72, 270. Archived from the original (PDF) on 10 April 2008. Retrieved 17 April 2009. ^ Podnieks & Szemberg 2008, Story #15–Great Britain wins Olympic gold. ^ Diem, Carl, ed. (January 1940). "The Fifth Olympic Winter Games Will Not Be Held" (PDF). Olympic Review (PDF). Berlin: International Olympic Institute (8): 8–10. Retrieved 3 March 2009. ^ a b Podnieks & Szemberg 2008, Story #82–USA sends two teams to the 1948 Olympics. ^ "Ice Hockey at the 1948 Sankt Moritz Winter Games: Men's Ice Hockey". sports-reference.com. Archived from the original on 30 May 2009. Retrieved 1 March 2009. ^ Comité Olympique Suisse (January 1951). Rapport Général sur les Ves Jeux Olympiques d'hiver St-Moritz 1948 (PDF) (in French). Lausanne: H. Jaunin. p. 69. Archived from the original (PDF) on 10 April 2008. Retrieved 3 March 2009. ^ "Past medalists–IIHF World Championships". International Ice Hockey Federation. Retrieved 1 March 2009. ^ "1952 – Winter Olympics VI (Oslo, Norway)". The Sports Network. Archived from the original on 2011-06-04. Retrieved 1 March 2009. ^ "Finland Ice Hockey: Men's Ice Hockey". sports-reference.com. Archived from the original on 3 September 2009. Retrieved 1 March 2009. ^ a b Podnieks & Szemberg 2008, Story #25–Soviet Union win their first Olympics, starting a new hockey era. ^ Podnieks & Szemberg 2008, Story #16–USA's original but unheralded "Miracle on Ice". ^ "1964 – Winter Olympics IX (Innsbruck, Austria)". The Sports Network. Archived from the original on 2009-09-03. Retrieved 1 March 2009. ^ "'64 Team Canada gets bronze medals". The Sports Network. 30 April 2005. Archived from the original on 2009-09-03. Retrieved 2 March 2009. ^ "1964 Canadian Olympic hockey team to be honoured". CBC Sports. 29 April 2005. ^ "IIHF denies Canada 1964 bronze". The Sports Network. 5 June 2005. Archived from the original on 2009-09-03. Retrieved 2 March 2009. ^ Xth Winter Olympic Games Official Report (PDF). Comité d'Organisation des xèmes Jeux Olympiques d'Hiver de Grenoble. 1969. p. 386. Archived from the original (PDF) on 26 February 2008. Retrieved 3 March 2009. ^ IIHF (2008). "PROTESTING AMATEUR RULES, CANADA LEAVES INTERNATIONAL HOCKEY". IIHF.com. Retrieved 25 August 2017. ^ a b c d e Podnieks & Szemberg 2008, Story #17–Protesting amateur rules, Canada leaves international hockey. ^ Podnieks & Szemberg 2008, Story #67–The perfect game against the best team: Czechoslovaks–Soviets 7–2. ^ Podnieks & Szemberg 2008, Story #97–B Pool Americans win Olympic silver in 1972. ^ a b The Official Report of XIth Winter Olympic Games, Sapporo 1972 (PDF). The Organizing Committee for the Sapporo Olympic Winter Games. 1973. pp. 228–229. Retrieved 6 April 2009. ^ Neumann, Bertl (ed.). XII. Olympische Winterspiele Innsbruck 1976 Final Report (PDF). Organizing Committee for the XIIth Winter Olympic Games 1976 at Innsbruck. p. 163. Archived from the original (PDF) on 26 February 2008. Retrieved 6 April 2009. ^ Roberts, Selena (9 February 2002). "Olympics: Opening ceremony; Pomp and Patriotism as Games Begin". The New York Times. Retrieved 2 March 2009. ^ a b c d e Podnieks & Szemberg 2008, Story #1–Miracle on Ice. ^ Swift, E.M. (3 March 1980). "The Golden Goal". Sports Illustrated. Retrieved 2 March 2009. ^ Allen, Kevin (23 December 1997). "College kids perform Olympic miracle". ESPN. Retrieved 2 March 2009. ^ Official Report of the Organising Committee of the XlVth Winter Olympic Games 1984 at Sarajevo (PDF). Sarajevo: Oslobodenje. 1984. p. 88. Archived from the original (PDF) on 21 December 2011. Retrieved 3 March 2009. ^ Podnieks & Szemberg 2008, Story #95–1988 Olympic silver – Finland is finally a true hockey power. ^ Podnieks & Szemberg 2008, Story #89–Finally, there's a real final game, The IIHF adopts a playoff system. ^ a b Podnieks & Szemberg 2008, Story #58–Raimo Helminen, 38, dresses for a sixth Olympics. ^ Podnieks & Szemberg 2008, Story #65–Igor Larionov openly revolts against coach, system. ^ Duhatschek, Eric (18 June 1989). "GMs figure Soviets one day will flood market". Calgary Herald. p. E4. ^ Sweeping Changes. Sports Illustrated. 27 September 2002. Retrieved 23 March 2009. ^ Podnieks & Szemberg 2008, Story #42–Breakup of old Europe creates a new hockey world. ^ a b Podnieks & Szemberg 2008, Story #59–Team with no name wins Olympic gold. ^ Podnieks & Szemberg 2008, Story #77–Recently separated, Czechs and Slovaks meet in World Championships final. ^ O'Connor, Joe (28 February 2009). "Owning the moment". National Post. International Ice Hockey Federation. Archived from the original on 19 November 2011. Retrieved 24 September 2010. ^ Howard, Johnette (28 February 1994). "Sweden Wins on Forsberg's Shot in Shootout". The Washington Post. Retrieved 4 March 2009. ^ Simmons, Steve (2006). "Medal for Mats". Toronto Sun. Retrieved 4 March 2009. ^ Podnieks & Szemberg 2008, Story #14–"Foppa" – The goal, the stamp & Sweden's first Olympic gold. ^ a b c d Lapointe, Joe (16 September 1997). "The N.H.L. 's Olympic Gamble; Stars' Participation in Nagano Could Raise Sport's Profile". The New York Times. Retrieved 17 February 2009. ^ Podnieks & Szemberg 2008, Story #12–Hasek thwarts all five Canadian gunners in epic shootout. ^ Farber, Michael (25 February 1998). "Was It Worth It?". Sports Illustrated. Retrieved 4 March 2009. ^ "Salt Lake stunner". Sports Illustrated. 20 February 2002. Retrieved 4 March 2009. ^ "Belarus pull off huge upset". BBC Sports. 21 February 2002. Retrieved 4 March 2009. ^ Podnieks & Szemberg 2008, Story #28–Vladimir Kopat bounces Sweden from the 2002 Olympics. ^ Podnieks & Szemberg 2008, Story #11–Canada wins Olympic gold for first time in 50 years. ^ Podnieks & Szemberg 2008, Story #8–Sweden's unique double, Olympics & Worlds. ^ "Finland defeats Slovakia to capture hockey bronze". The Sports Network. 28 February 2010. Archived from the original on 2011-06-29. Retrieved 24 September 2010. ^ Byers, Jim (28 February 2010). "Canada beats U.S. in OT for hockey gold". Toronto Star. Retrieved 28 February 2010. ^ "Tournament Format". Retrieved 22 February 2014. ^ Martin Merk (18 February 2014). "Looking for history". Archived from the original on 25 February 2014. Retrieved 22 February 2014. ^ ROY MACGREGOR (19 February 2014). "Ted Nolan has Latvian players believing in themselves". Retrieved 22 February 2014. ^ Rod Perry (19 February 2014). "Russians dejected after Olympic hockey loss to Finland". Archived from the original on 23 February 2014. Retrieved 22 February 2014. ^ Lucas Aykroyd (22 February 2014). "Fine Finnish for Selanne". Retrieved 22 February 2014. ^ The Canadian Press (23 February 2014). "Canada defeats Sweden to defend Gold in Olympic Men's Hockey". The Sports Network. Archived from the original on 2014-02-27. Retrieved 23 February 2014. ^ a b c Karolos Grohmann (12 September 2017). "No late deal for NHL players at Pyeongchang – IIHF's Fasel". Reuters. Retrieved 3 September 2018. ^ Mary Clarke (7 February 2018). "Russian team leads final 2018 Winter Olympic men's hockey gold medal odds". SBNation.com. Retrieved 3 September 2018. ^ Tyler Lauletta (8 February 2018). "Here are the gold-medal favorites for every single event at the Winter Olympics". Business Insider. Retrieved 3 September 2018. ^ Will Hobson (15 December 2017). "Russia banned from 2018 Olympics for widespread doping program". The Washington Post. Retrieved 3 September 2018. ^ Matt Bonesteel (23 February 2018). "Woe, Canada? Germany stuns hockey power at PyeongChang Olympics". The Washington Post. Retrieved 3 September 2018. ^ Dan Burns, Steve Keating (25 February 2018). "Olympics: Ice Hockey – Russians sing banned anthem after beating Germany to gold". Reuters. Retrieved 3 September 2018. ^ Dan Burns (24 February 2018). "Ice hockey: Canadian men beat Czechs to claim bronze". Reuters. Retrieved 3 September 2018. ^ The Canadian Press (22 July 2008). "Wickenheiser signs with Swedish men's club". CBC Sports. Retrieved 1 March 2009. ^ Yi-Wyn Yen (20 February 2008). "Canada's leading star". Sports Illustrated. Retrieved 1 March 2009. ^ The Canadian Press (27 July 1992). "Canadians cheer new Olympic sports". Waterloo Region Record. ^ a b c "An Agreement By Nagano Games". The New York Times. 29 November 1992. Retrieved 17 February 2009. ^ a b Ormsby, Mary (18 November 1992). "Women 's hockey gets approval for '98". Toronto Star. ^ "Ice Hockey at the 2006 Torino Winter Games: Women's Ice Hockey". sports-reference.com. Archived from the original on 7 April 2009. Retrieved 4 March 2009. ^ "Women's Hockey History". CBC Sports. Archived from the original on 3 September 2009. Retrieved 17 February 2009. ^ Podnieks & Szemberg 2008, Story #33–Women's hockey enters Olympics—USA hands Canada first loss. ^ Edvinsson, Jan-Ake, ed. (March 2002). "And the winner is ... Hockey!" (pdf). Ice Times. International Ice Hockey Federation. ^ "Women's Olympic Ice Hockey Standings". Sports Illustrated. 2002. Retrieved 7 April 2009. ^ "U.S. women's hockey team exonerated in flag dispute". Sports Illustrated. 25 February 2002. Retrieved 7 April 2009. ^ Crosse, Simon (24 February 2002). "The big two dominate". BBC Sport. Retrieved 6 April 2009. ^ Yi-Wyn Yen (17 February 2006). "Their own Miracle". Sports Illustrated. Retrieved 1 March 2009. ^ Judd, Ron (18 February 2006). "Miracle whipped: A stunning changing of the guard in women's hockey". The Seattle Times. Archived from the original on 2 September 2009. Retrieved 2 March 2009. ^ Crouse, Karen (18 February 2006). "Competition Catches Up to U.S. Women". The New York Times. Retrieved 2 March 2009. ^ "Best women's team ever?". CBC Sports. 23 February 2006. Retrieved 1 March 2009. ^ Podnieks & Szemberg 2008, Story #35–Swedish "Mirakel" as USA bumped from Olympic gold-medal game. ^ "Women's Tournament Schedule Proposal". International Ice Hockey Federation. Retrieved 4 March 2009. ^ "Canada brings home Olympic gold in women's hockey". Vancouver Sun. 25 February 2010. Retrieved 25 February 2010. ^ "Poulin scores OT winner, Canada wins gold over U.S." The Sports Network. 20 February 2014. Archived from the original on 2014-02-21. Retrieved 20 February 2014. ^ "Swiss women rally to beat Sweden for hockey bronze". The Sports Network. 20 February 2014. Archived from the original on 2014-02-20. Retrieved 20 February 2014. ^ Rodus, Karyn (22 February 2018). "US women's hockey team finally gets gold in dramatic final against rival Canada". ABC News. Retrieved 22 February 2018. ^ "U.S. women end Canada's streak to win hockey gold in shootout at 2018 Winter Olympics". USA TODAY. Retrieved 2018-02-22. ^ "More women's teams at Olympics". iihf.com. 22 July 2018. ^ Podnieks & Szemberg 2008, Story #7–NHL takes break and releases players for 1998 Olympics. ^ Lapointe, Joe (11 February 2002). "Olympics: Hockey; N.H.L. and Its Teams Send Players to Bench". The New York Times. Retrieved 1 March 2009. ^ "Ice Hockey at the 2006 Torino Winter Games: Men's Ice Hockey". sports-reference.com. Archived from the original on 27 March 2009. Retrieved 1 March 2009. ^ "Men's tournament programme & schedules". International Ice Hockey Federation. Retrieved 4 March 2009. ^ "Germany, Norway round out 2010 Olympic men's hockey". TSN. 8 February 2009. Archived from the original on 2009-02-13. Retrieved 9 February 2009. ^ "Women's Tournament Program". International Ice Hockey Federation. Archived from the original on 25 February 2009. Retrieved 4 March 2009. ^ a b c "IIHF Eligibility". International Ice Hockey Federation. Archived from the original on 27 April 2009. Retrieved 11 March 2009. ^ Podnieks & Szemberg 2008, Story #6–First Canada Cup opens up the hockey world. ^ Litsky, Frank (25 January 1984). "Eagleson upset over hockey dispute". The New York Times. ^ "Canada considers hockey withdrawal". The New York Times. 5 February 1984. ^ Monsebraaten, Laurie (15 October 1986). "Players in NHL are now eligible in the Olympics". Toronto Star. ^ "Amateurism". USA Today. 12 July 1999. Retrieved 3 March 2009. ^ Dryden, Ken (6 March 1988). "Aiding U.S. Olympic Team May Bring Gold to N.H.L., Too". The New York Times. Retrieved 15 March 2009. ^ Associated Press (3 October 1995). "NHL makes peace with union and sets up Olympic 'Dream Tourney'". Rocky Mountain News. ^ Garrioch, Bruce (12 February 2002). "Blame must be shared for Slovakia's collapse". Slam! Olympics. Canadian Online Explorer. Retrieved 1 March 2009. ^ The Canadian Press (3 January 2005). "IIHF not giving up on NHLers in Turin". The Sports Network. Archived from the original on 2009-09-03. Retrieved 8 March 2009. ^ LeBrun, Pierre (22 July 2005). "2010 Olympics needs to ratify deal IIHF". Slam! Sports. Canadian Online Explorer. Archived from the original on 3 September 2009. Retrieved 8 March 2009. ^ Hornby, Lance (2006). "Some owners cool to Olympic flame". Toronto Sun. Canadian Online Explorer. Retrieved 1 March 2009. ^ "Fasel angry at absent NHLers". CBC Sports. 12 February 2006. Retrieved 1 March 2009. ^ The Canadian Press (24 February 2006). "Hockey changes likely for 2010 games". The Sports Network. Archived from the original on 2009-09-03. Retrieved 1 March 2009. ^ a b "To play or not to play". CTVOlympics.ca. Canada's Olympic Broadcast Media Consortium. 23 September 2009. Archived from the original on 26 September 2009. Retrieved 23 September 2009. ^ a b Burnside, Scott (28 September 2008). "Kelly: As many as eight teams could open next season in Europe". ESPN. Retrieved 1 March 2009. ^ "NHL and NHLPA reach deal on Collective Bargaining Agreement". The Sports Network. 6 January 2013. Archived from the original on 2013-01-06. Retrieved 6 January 2013. ^ "Deal reached to send NHL players to 2014 Winter Olympics". The Sports Network. 19 July 2013. Archived from the original on 2013-07-21. Retrieved 20 July 2013. ^ "NHL may skip Olympics after 2010". CBC Sports. 28 November 2007. Retrieved 19 March 2009. ^ a b LeBrun, Pierre (5 October 2008). "Sens' owner convinced of European expansion, Bettman skeptical". ESPN. Retrieved 29 May 2009. ^ "Bettman and Fasel face off". CTV Olympics. 27 March 2009. Archived from the original on 3 March 2010. Retrieved 6 April 2009. ^ Klein, Jeff Z.; Hackel, Stu (14 February 2009). "K.H.L. Leader Chides N.H.L. On 2014 Games". The New York Times. Retrieved 19 March 2009. ^ "Olympics and N.H.L. Face Off Over Who Pays to Insure Players". The New York Times. 19 May 2016. Retrieved 21 May 2016. ^ Jared Clinton (8 May 2017). "NHL said Olympic matter is closed, but IIHF president Fasel begs to differ". The Hockey News. Retrieved 9 October 2018. ^ "The NHL said no to the 2018 PyeongChang Olympics and players aren't happy". CBC.ca. 4 April 2017. Retrieved 9 October 2018. ^ "Statement from Alex Ovechkin on 2018 Winter Olympics". NHL.com. 15 September 2017. Retrieved 9 October 2018. ^ Ben Shpigel (4 April 2017). "N.H.L. 's Olympics Stance Leaves Players Cold". The New York Times. Retrieved 9 October 2018. ^ Andrew Bottomley (15 February 2018). "Boudreau to Ovechkin: 'I thought you were going to the Olympics!'". Sportsnet.ca. Retrieved 2018-04-08. ^ Podnieks & Szemberg 2008, Story #19–IIHF allows bodychecking in all three zones. ^ "All game-winning shot competitions ("shootouts")" (PDF). International Ice Hockey Federation. Archived from the original (PDF) on 18 March 2009. Retrieved 12 March 2009. ^ Podnieks & Szemberg 2008, Story #27–Dropping the red-line, allowing the two-line pass changes the Game. ^ "IIHF Rule Book". International Ice Hockey Federation. Retrieved 11 March 2009. ^ "VANOC shrinks Olympic ice". The Vancouver Sun. Canadian Online Explorer. 24 February 2009. Retrieved 11 March 2009. ^ a b National Hockey League (2014). "Hybrid icing tops list of rule changes for 2013–14". National Hockey League. Retrieved 9 February 2014. ^ National Hockey League (2005). "Major penalties". National Hockey League. Retrieved 8 June 2006. ^ "Ice Hockey Essentials – International vs. NHL". CBC Sports. 4 December 2009. Retrieved 24 February 2012. ^ Burnside, Scott (25 July 2005). "Rule changes geared toward entertainment". ESPN. Retrieved 12 March 2009. ^ "Olympics vs. NHL: How the rules are different". ESPN. 16 December 2005. Retrieved 8 March 2009. ^ Burnside, Scott (14 December 2005). "Tough test for Turin; cap on the brain". ESPN. Retrieved 8 March 2009. ^ Podnieks & Szemberg 2008, Story #31–Zebras told to crackdown—once and for all. ^ "Men's Tournament Program". International Ice Hockey Federation. Archived from the original on 28 March 2009. Retrieved 4 March 2009. ^ "IIHF Eligibility". International Ice Hockey Federation. Retrieved 4 March 2009. ^ "Forsberg livid Canadians will ref Olympic gold-medal game". Toronto Sun. 22 February 2014. Retrieved 22 February 2014. ^ "Russian hockey fans protest referee's controversial call outside U.S. Embassy". USA Today. 17 February 2014. Retrieved 22 February 2014. ^ "Anti-Doping". International Ice Hockey Federation. Archived from the original on 29 December 2008. Retrieved 18 March 2009. ^ "World Anti-Doping Code" (PDF). Montreal: World Anti-Doping Agency. 2003: 24–37. ^ "NHL discusses doping procedures". CBC Sports. 8 March 2001. Retrieved 18 March 2009. ^ Roberts, Selena (9 March 2001). "N.H.L. and U.S.O.C. Disagree on Drug Policy". The New York Times. Retrieved 18 March 2009. ^ "Drug Testing Agreement Made Final". The New York Times. 22 March 2001. Retrieved 17 March 2009. ^ Hunt, Thomas M. (2007). "Sports, Drugs, and the Cold War" (PDF). Olympika, International Journal of Olympic Studie. International Centre for Olympic Studies. 16 (1): 22. Retrieved 29 May 2009. ^ Strauss, Michael (13 February 1976). "Czechoslovakia Forfeits for Drug Use; U.S. Downs Poland in Hockey". The New York Times. Retrieved 18 March 2009. ^ Litsky, Frank (22 February 1988). "Polish Hockey Star Is Banned". The New York Times. Retrieved 18 March 2009. ^ "Ohlund cleared for Olympics". CBC Sports. 21 January 2002. Retrieved 18 March 2009. ^ "Olympics; British Skier Stripped of Medal". The New York Times. 22 March 2002. Retrieved 22 March 2009. ^ "Visnovsky reprimanded". IIHF. 28 February 2010. Archived from the original on 25 February 2014. Retrieved 23 February 2014. ^ "Pavlovs disqualified". IIHF. 14 February 2014. Archived from the original on 25 February 2014. Retrieved 22 February 2014. ^ "Backstrom to receive Olympic Silver, Despite Suspension". The Sports Network. 14 March 2014. Archived from the original on 2014-03-21. Retrieved 15 March 2014. ^ Julian Linden (23 February 2014). "Ice hockey officials slam IOC over Backstrom doping test". Reuters. Archived from the original on 23 February 2014. Retrieved 23 February 2014. ^ Duhatschek, Eric (23 February 2014). "Sweden's Backstrom Tests Positive For Banned Substance". The Sports Network. Archived from the original on 2014-02-27. Retrieved 23 February 2014. ^ a b c "IOC sanctions 11 Russian athletes as part of Oswald Commission findings". International Olympic Committee. 22 December 2017. Retrieved 22 December 2017. ^ "Berard tests positive for Nandrolone". The Sports Network. 20 January 2006. Archived from the original on 2009-09-03. Retrieved 18 March 2009. ^ "No violations in NHL drug tests". CBC Sports. 12 June 2006. Retrieved 18 March 2009. ^ Associated Press (12 June 2006). "No players failed drug tests this season, NHL says". ESPN. Retrieved 18 March 2009. ^ "Ice hockey and Olympism" (PDF). Olympic Review. International Olympic Committee. 1984. ^ "Ice hockey – Olympics". Sports-reference.com. Archived from the original on 18 February 2009. Retrieved 9 March 2009. Judd, Ron C. (2008). The Winter Olympics: An Insider's Guide to the Legends, the Lore and the Games (Vancouver ed.). Seattle: The Mountaineers Books. ISBN 1-59485-063-1. Kennedy Jr., John F. (2004). "Innsbruck 1976". In Findling, John E.; Pelle, Kimberly, D (eds.). Encyclopedia of the modern Olympic movement (illustrated, revised ed.). Greenwood Publishing Group. ISBN 0-313-32278-3. Morales, Yves (2004). "Pre-Olympic winter games". In Findling, John E.; Pelle, Kimberly, D (eds.). Encyclopedia of the modern Olympic movement (illustrated, revised ed.). Greenwood Publishing Group. ISBN 0-313-32278-3. Podnieks, Andrew; Szemberg, Szymon (2008). IIHF Top 100 Hockey Stories of All-Time. H. B. Fenn & Company, Ltd. ISBN 978-1-55168-358-4. Retrieved 25 March 2009. Podnieks, Andrew; Szemberg, Szymon (2008). World of Hockey: Celebrating a Century of the IIHF. Key Porter Books. ISBN 1-55168-307-5. Podnieks, Andrew; Gibbons, Denis; Wawanash, Sheila; Barta, Pavel; Ryzkov, Dimitry; Ratschunas, Tom (2002). Kings of the Ice: A History of World Hockey. NDE Publishing. ISBN 1-55321-099-9. 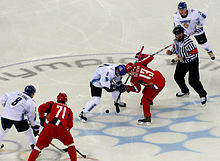 Wikimedia Commons has media related to Ice hockey at the Olympics. This page was last edited on 22 April 2019, at 17:46 (UTC).